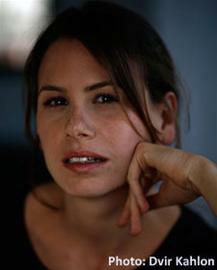 Adva Bolle, an actress as well as a writer, was born in Netanya, Israel, in 1980 and lives in Tel Aviv. She studied acting in her hometown school and began performing in plays as a child. Bolle is a graduate of the Acting School of Kibbutzim College. Uncle Hanek, a play based on stories of her family, was written and directed by Yankele Yakobson while she was still at college (2006). Bolle has played a variety of roles in movies, TV series and the theater. In 2011 she was nominated for Actress of the Year. She also writes for the theater and teaches acting and movement at the Nissan Nativ Acting Studio. Adva Bolle has received a grant from the Rabinovich Foundation to write a script based on Things that I Know about R.